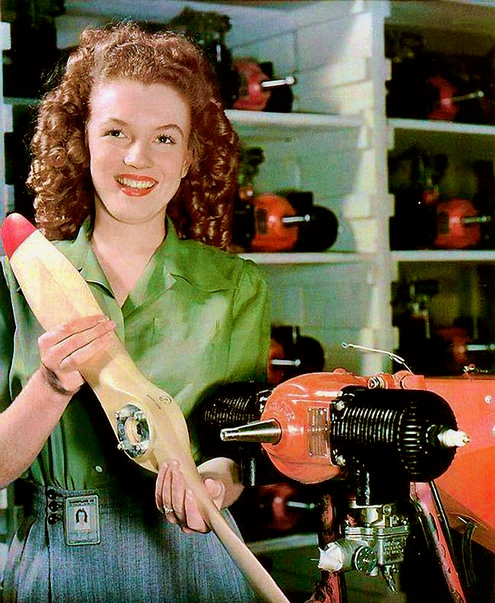 Working 10 hours a day for $20 a week in a World War II defense plant 70 years ago was 18-year-old Norma Jeane Dougherty, wife of a young United States merchant seaman assigned overseas. Her company, called Radioplane, in Burbank, Calif., founded by the British character actor Reginald Denny, made small remote-controlled pilotless aircraft, intended to help United States Army and Navy anti-aircraft gunners refine their targeting skills. In recent times, the word drone has become known for something far more lethal. After the attacks of September 2001, the United States deployed Predator pilotless aircraft against targets in Pakistan and Afghanistan as a key weapon in the struggle against terrorism. Back on the home front that summer, Ms. Dougherty inspected and sprayed parachutes in Burbank, despite warnings from her mother-in-law, a Radioplane nurse who had gotten her the job, that the fumes would ruin her “beautiful hair” and her health. The young assembly worker won a $50-dollar war bond after being elected “queen” of the company picnic. The following June, while the Allies were still fighting the imperial Japanese, Norma Jeane, brandishing a propeller and with her Radioplane ID at her waist, was photographed, using rare color film, by Private David Conover of the Army’s First Motion Picture Unit in Culver City, Calif. He had been assigned to snap some fresh Rosie the Riveter-type pictures of women in war production. Once it was published, this image and others like it helped to open a Hollywood future for Norma Jeane, who soon changed her name to Marilyn Monroe. (She was born 88 years ago this week.) They also established a historical link with the only American president with a Hollywood background, because the commanding officer who gave Conover this assignment was Captain Ronald Reagan.